DOWNLOAD the full page PDF or DOWNLOAD the e-book version. 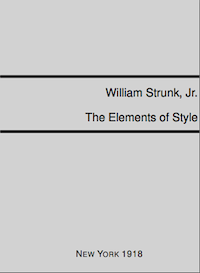 I was “ordered” to read “The Elements of Style” by William Strunk, Jr. a long time ago. I tried to find a decent looking version to download, but all I could find where free HTML versions or expensive nice looking ones. So I decided it could not be too hard to just put a few LaTeX statements around the out-of-copyright text of 1918. I did, and it still looked horrible. So I worked on it some more. After putting in ten hours I decided to share the result with the world. I tried to put it up at Gutenberg.org, but they could not accept it for some obscure reason I forgot. They did accept an other version much later. I put the PDF file up at my university homepage. For the last decade I have been receiving thank-you notes. I don’t know how much longer the university will host my homepage, therefore I moved the PDF download file here to CodeBlab. I received an e-mail from Haochen Zhao, suggesting I would create a version for the Kindle. I thought it a nice idea. However, I don’t own a Kindle. I made a version that fits in 9x12cm with small margins and refined it based on further e-mail exchanges with him, including photo’s of his Kindle. So now I host two versions: one in a 1920’s book style and one more modern and suitable for the Kindle and similar devices. Also you can read the related blog entry on the Makefile for LaTeX.